Bass Players rejoice! The compact Linden E.Q. 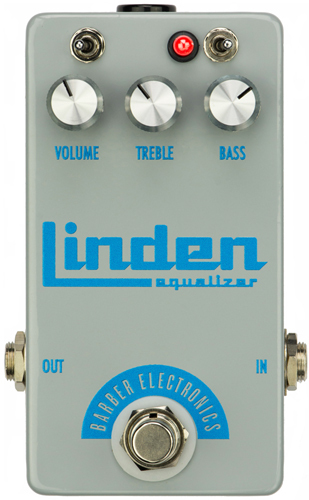 brings those golden tones of yesteryear to your modern bass rig, the Linden E.Q. captures the sweetest and most recorded bass E.Q. circuit in a simple foot operated box. The Barber Linden is a ultra high headroom device that employs a sophisticated power scheme to draw 25 working DC volts from a standard 9 volt supply, resulting in far superior headroom over a standard 9 volt powered pedal. The E.Q. circuit is derived from the great flip top amps that were manufactured in Linden New Jersey, our new pedal pays homage to these great portable bass amps and their excellent eq. The Linden's eq is a perfect balance tight and powerful low band with a seductively sweet high band that is somehow "charmingly aggressive" without any abrasive shards that could offend. The new compact version has two toggle switches to allow you to choose from EQ curves for aggressive upper mids, open highs, or softer mids for aggressive playing styles, and the second toggle allows you to choose between normal, bright and tight input path. Improve your bass rig today with a Barber Linden E.Q. ONLY $149.95...Introductory price only $99.95! Powered by standard 9 volt - tip supplies.